Do you feel like some other entities exist around us, just as ultraviolet rays exist around us that we can’t perceive, and only certain animals are, perhaps even only sometimes, aware of them? Even mainstream science recognizes cats, dogs, and other animals can see frequencies humans can’t. It’s well known that dogs and cats have much better senses than humans. According to Animal Planet, a dog’s eyes “detect more delicate movements; his sense of smell is 1,000 to 10,000 times more sensitive than a human’s. He can hear much higher frequencies, and at four times the distance of a human with normal hearing.” This, some claim, could mean that dogs and other animals also sense the paranormal, and are often more accepting of it. Their keen senses mean that animals may also have the ability to predict earthquakes, a belief that, as National Geographic reports, dates back centuries. In records from the year 373 BC, historians noted that many animals, “including rats, snakes and weasels” fled the Greek city of Helice prior to a devastating earthquake. This is a phenomenon that continues to be observed to this day, though it is still not fully understood. Of course, there’s a big difference between earthquakes and spirits. However, this simply goes to underline the fact that animals, including dogs and cats, may sense many things that we are not able to. It makes sense scientifically in a separate way from spiritually. It’s simple really: the scientific explanation is that cats and dogs can see UV light and a few other rays, which human retinas don’t have the ability to see. Many studies that have been carried out on the senses of dogs offers quite a debate on the psychic abilities and sensory perceptions of them. There is, of course, no way to know what is really going on because we cannot communicate on the level we would need to for confirmation. I believe there is something more to this phenomena that delves into the metaphysical realm. 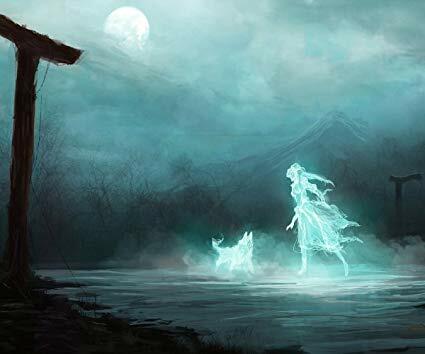 So, what will your dog do if they see a spirit? We’re not exactly sure! 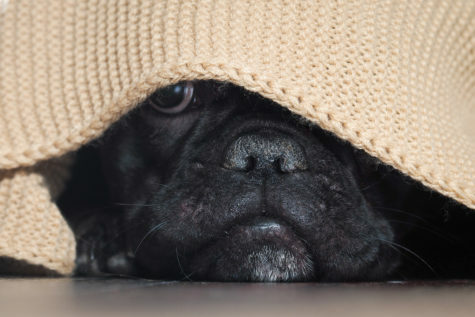 We do know there are a few things your dog might do if they see something you don’t, though. You might notice your dog’s body stiffen and they might start growling or barking. They might also put their ears up and sniff to get more information about what they are seeing. Dogs use their senses of hearing and smell much like humans use their sense of sight. 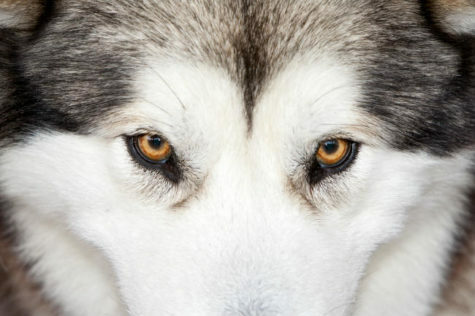 So, you might see your dog doing more with their nose or ears than their eyes or paws. Since we don’t have much information about dog-spirit sightings, we are left to speculate what your pup might do. They might think the spirit is an intruder and chase them around. Some spirits have been known to be good with animals, though. So, your pooch might like the spirit. It all depends on the situation. If your dog is staring into the air at nothing or chasing something you can’t see, could it be something supernatural? Maybe! One night, she and her dog, Lola, were about to go to bed. But Lola began to act strangely. She jumped up and went to the bed’s edge, as if to look over. Her eyes then began to follow something in the air, something invisible. “I would call her name and she wouldn’t move,” Lillibeth wrote. She turned on the light to see if perhaps Lola was being pestered by a fly or a mouse, but she saw nothing. Then, as if in fear, Lola curled up against Lillibeth, occasionally glancing over the edge of the bed throughout the night. Was Lola afraid of something her owner could not see? These are questions I suppose we can’t answer. We can’t speak to our pets and know what they’re thinking. What are their eyes following when we see nothing there? Why are they barking or growling, why are they afraid? Has your pet ever acted strangely? Do you believe it was a ghost? Can cats see ghosts? How about angels? Fairies? Or even demons? Well, animals may not use a language to communicate like humans but a true animal observer will realize that animals do communicate very well with their sounds and body language. The cat is one such species and apart from communicating with their owners, they have a connection with each other as well. It might seem a bit unusual for humans who consider this preposterous but if you observe cats keenly, they are not as unintelligent as many of us might consider them to be. Some of the Feline observers have found their cats staring continuously at a particular spot from later they found unusual sounds coming from the same spot. Other instances include cats sense ghosts and staring at the stairway like someone is walking up and down and later it looks like they are trying to fight something off their face. Some of us might consider it as playing or other might just think this is the way cats behave. But is that really true? 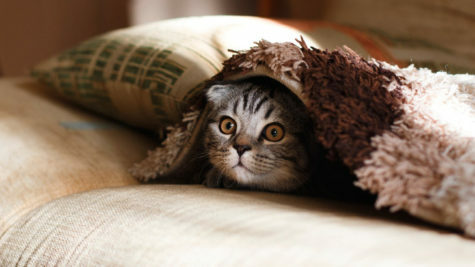 There was another cat who lived with his pet owner and kept staring at a room, later the owner said that she could hear some unusual sounds coming from the room. Did the cat see anything that was not visible to the naked eye? 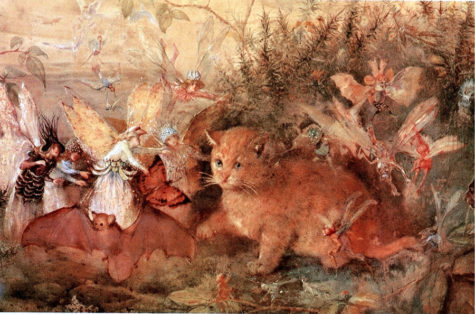 It has been predicted that cats can see things from the spiritual world which normal people usually cannot. After a few studies it has been found that cats genuinely know more than humans, they feel the vibrations and that is the reason they despise people who are not fond of cats. It is quite shocking but they can sense the negativity coming from them and they too tend to stay away from such people or you might find them hissing while such people are around. They even know when their owners are going to arrive and who loves them the most. They are even capable of realizing any danger that is near them or near their pet parents. They even understand when their caretaker is sad or hurt and such telepathic traits make it more suspicious that they are completely capable of sensing people who have left their bodies (souls). Do Cats Protect Us From Spirits? It has been observed that cats behave weird when they sense an unusual presence around them. It is even said that they do not like a place if they sense any psychic presence there. It has been said in the Ancient Egyptian mythology that cats are blessed with the power to ward away evil spirits, but is that true? There have been sayings that dogs bark in the night in order to ward away any evil spirits. The same has been the case with the feline creatures as well. Buddhists believe that cats are the souls of the dead who live in the bodies of cats before they get another new life. 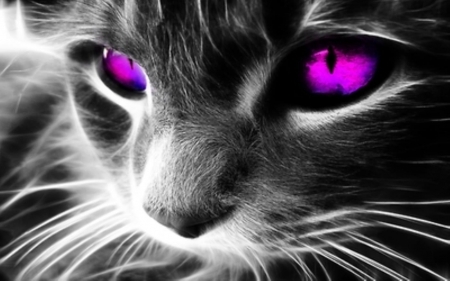 Cats are also believed to see any aura or evil presence around human beings. Many believe that cats can easily predict future as they get to ‘know’ or can easily sense feelings. They certainly may not be able to completely protect you from evil spirits but can certainly warn you if anything bad is to happen. The ancient Egyptians worshiped them as gods, and believed that cats took on a spiritual importance and were considered to be a sacred animal with magical powers. In some myths, cats are able to walk in and out of the spirit world as they please. Is it true? Can cats see ghosts? Here are some signs to look out for. The out of nowhere poofy tail and flat ears. You’re just sitting there, watching netflix… and you get a sudden chill down your spine. You look over and see your cat all puffed up and looking scary. Yep… Your cat is looking at a ghost. They stare at seemingly nothing, like the corner of the wall or ceiling. Ever been lying in bed and your cat suddenly perks up and is staring at the ceiling above your head? It could be a spirit, a ghost, or even fairies or an angel. The loud bump in the night but your cat is sitting next to you. We hear bumps in the night and us cat owners know that it must be Fluffy running around doing cat stuff. Then you remember that Fluffy is curled up next to you and you see him staring out towards the dark hallway… Possible explanation? A ghost is messing with your stuff and your cat is watching it happen. Your cat’s sudden disappearance and sudden reappearance. One second you see your cat walk into the room, the next second, he’s gone. You call and look everywhere… but no signs. You check their usual spots, above the kitchen counters, under the bed, in the cat tree, the litter box… nothing…. This is simple. Your cat has found the portal into the ghost dimension and curiosity got the best of him. Don’t worry – he’ll return. Cats can come and go as they please. Shake some treats and your cat will suddenly appear in front of you again. Growling or hissing at something invisible. You’re just minding your own business, sipping a glass of wine and watching The Walking Dead when your cat stares behind you and begins to hiss… even worse… growl. Of course you’re home alone… but you feel the hairs on your neck rise. 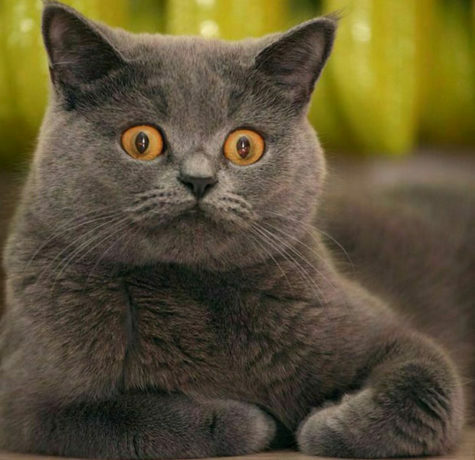 Your cat sees something… a ghost? Or something else? Playing with an invisible friend. There are times when you might have seen a cat behave weirdly as if something exists around or as if it is playing with something. This might be seen as a playful nature but not all the times can you tell that. Looking at someone who isn’t there. There are a few owners who have said that they have seen their cats eyeballs move as if it was looking at someone walking by or running up and down the stairs. A trail of bread crumbs just in case you lose your way exploring your higher power. 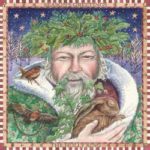 Site News > The Powers That Be > What’s New > Animal Guides and Totems > Can Cats and Dogs See Spirits?